I woke up to a cloudy Sunday morning. Forecast wasn’t helping with photography related plans, therefore I wasn’t rushing with getting outside. Passing by a kitchen window I’ve noticed something strange. Bird feeders were full but no birds around. I could swear that I heard them couple of minutes earlier fighting for the “front row” at the feeders. I was ready to walk away when over sudden I’ve noticed unfamiliar shape, hidden between bare branches. I screamed “Cooper’s Hawk!” and run to my room to grab my camera. With camera ready to shoot I opened window very slowly, trying not to scare this hawk away. This didn’t work out well but luckily hawk landed on the nearby fence. Because it was a cloudy morning, and I left my tripod in my car, I was forced to use high ISO settings. This combined with 8 frames per second shooting mode, gave me certainty that I will get sharp images. Even though shooting 8 frames per second produced a noticeable noise, similar to a typewriter, hawk seemed to be interested and was looking around to find it’s source. He finally found it and looked straight to the lens giving me opportunity for a nice pictures. After couple of minutes hawk left, leaving me with nearly 200 images 🙂 What a morning! 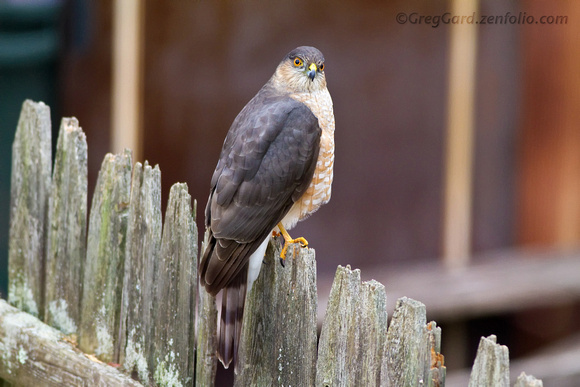 Sharp-shinned Hawk©Greg Gard - greggard.zenfolio.com - Canon EOS 7D, 400mm F5.6, ISO 1600, 1/400s, f/5.6 AV mode, Handheld. Full frame. 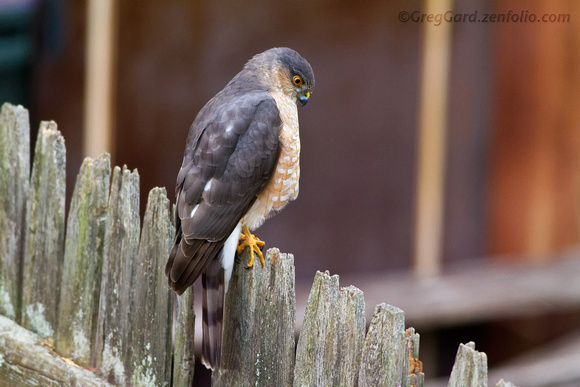 After some research I found out that this was a Sharp-shinned Hawk, not a Cooper’s Hawk as I originally thought. Both birds are very similar to each other but there are significant differences, such as: length and shape of the tail, size of the body and legs.